by Lavenda, Robert H.; Schultz, Emily A. Designed for courses that make extensive use of ethnographies and other supplementary readings, this is a concise introduction to the basic ideas and practices of contemporary cultural anthropology. 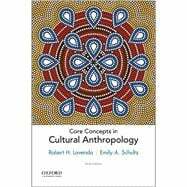 Not a standard textbook, Core Concepts in Cultural Anthropology, Sixth Edition, is more of an annotated bibliography of the terms and concepts that anthropologists use in their work. The book prepares students to read ethnographies more effectively and with greater understanding. Robert H. Lavenda is Professor of Anthropology and Co-Chair of the Department of Sociology and Anthropology at St. Cloud State University. 2.5 The Boundaries of Culture? 5.1 What Is Social Organization? 9.1 The "Arts of Subsistence"
Why Are You Reading This Ethnography (and How Should You Read It)?